In Visual Basic 2015, looping is a process that involves a procedure that runs repetitively until a certain condition is met. 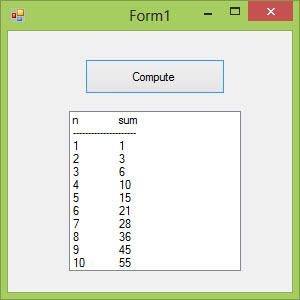 For example, we can design a program that adds a series of numbers until the sum exceeds a certain value or a program that asks the user to enter data repeatedly until he or she enters the word 'Finish'. In order to exit a For…..Next Loop, you need to place the Exit For statement within the loop. It is normally used together with the If….Then statement. For its application, you can refer to example 15.1 d.
1000-100-95-90-………-5. In this case, the increment is negative. This program uses Exit ...For to escape the loop when n is greater than 6. We can also use Exit Do to escape the loop. In this example, the procedure will keep on adding the initial number by 1 until it exceeds 1000. In this example, the procedure will keep on adding a number by 1 and display the results in a list box. The process stops when it has repeated 100 times.